There are many countries in tropical Asia claiming to be the Stupa-world-record-holder. 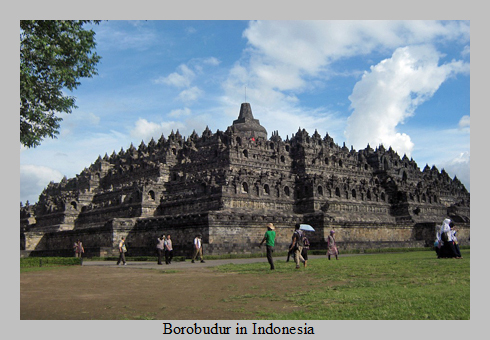 Indeed, India has the oldest stupas, on the territory of Pakistan there was the first giant stupa, Nepal has stupas claiming the longest mythical history, Myanmar has by far the most stupas and the most richly adorned, Thailand has the tallest one, and Indonesia’s Borobudur is regarded as the largest Buddhist monument by UNESCO. However, concerning giant stupas, Sri Lanka is definitely the number 1 and the true record-holder. Measuring the volume, the four largest ancient stupas of the world are in Sri Lanka (though the very largest one is not recognizable as a stupa any more, see below, and modern stupas from the 20th century can surpass the ancient ones in size). Additionally, the giant stupas in Sri Lanka are more than a millennium older than those of Southeast Asia. And in contrast to their counterparts in Myanmar, Thailand, Laos and Cambodia, they show the original form of a stupa, the hemispherical dome. ​The Sanskrit word "stupa" originally means "heap". The Prakrit and Pali derivation "Thupa" had been angliscised as "Tope", a word often used in scientific literature in the the 19th century, but rarely used today. A stupa was an artificial mound constructed over the remains, ashes and bones, of a cremated body of an important person, particularly Shramanas, i.e. ascetics and spritual teachers. This pre-Buddhist burial tradition was adopted by Buddhism - according to the Scriptures ordered by the Buddha himeself. Thus, a stupa is originally sepulchral architecture. But like a Christian altar containing remains of dead saints, a stupa became a sacred place of veneration. There are many other words in use for “Stupa”. Almost all of them refer to the burial place of a cremated person. For example, The words "Dagoba" and "Dagaba" for stupa are derived from the Pali term "dhatu gabbha", meaning "relics in the womb". "Chaitya" in Sanskrit and "Chetiya" in Pali are derived from the root "chit" for "burning". "Seya" is an indigenous abbreviation for "Chetiya" in Sri Lanka, whereas "Chedi" is the most common abbreviation used in Thailand, "Ta" being the corresponding Chinese term. There is another word for “Stupa”, which causes much confusion: “Pagoda”. This is a term introduced by the Portuguese. And there are many different theories concerning the etymology: What could have been the indiginous term which was latinized by the Europeans to “Pagoda”? One very simple answer is: A slight misunderstanding of the word “Dagoba”. In some Buddhist countries, the term “Pagoda” refers not to a stupa builing, but to other religious structures. For example, in Vietnam and Cambodia, due to French translation, the term “Pagoda” refers to places of worship still in use, in these countries it is a common name vor a Buddhist temple or monastery as a whole, corresponding to what is called, more accurately, a “Vihara” in Sri Lanka. Even more confusing is this: A Chinese or Korean or Japanese “Pagoda” seems to be a completely different type of architecture, having nothing in common with a Southasian Stupa. Indeed, a stupa originally is a wide and massive dome, whereas a a “Pagoda” is a tall building, the groundplan of which is usually not circular, but has eight straight edges. A Stupa may have a relic chamber hidden inside, but it is not accessible any more. In contrast, a Pagoda in the Fareast has walkable internal spaces. Every stupa is a sacred site, whereas some pagodas are secular, e.g in garden architecture. Nevertheless, the Stupa, both in function and in design, is the origin and prototype of all Pagodas. Transitional forms can be found in the Himalayas and in Yunnan Province in Southern China. One alternative proposed etymology of “Pagoda” is from the southern Chinese pronunciation of “eight-cornered-tower”: "Pa-Ko-Ta". Another proposed origin is the Persian term “But-kada”, meanin "idol-dwelling". Another proposed derivation e “bhagavat”, the Sanskrit term for "blessed". Almost every Buddhist temple in Sri Lanka has a stupa. Most of them are painted white and many of them are placed on a granite boulder, making the contrast of the whte stupa and the dark underground a characteristic feature of Sinhalese monastic architecture and a landmark of Sri Lanka. There are different types of remains in Buddhist stupas. Only the most sacred ones claim to contain original Buddha relics. Many more stupas enshrine relics of Buddhist saints or locally venerated monks or nuns. All kinds of stupas with bodily relicts are called Saririka Stupas. Other stupas “bury” things used by an Arahant or Buddha, like parts of the robe or the alms bowl. This type is called Paribhogika Stupa. Some stupas just commemorate a location that played a role in the Buddha's life. Such memorial buildings indicating Buddha visited places are called Uddesika Stupas. Last not least, most stupas, votive stupas in particular, contain symbolic relics, for example Sacred Texts. This tradition seems to be influenced by Mahayana Buddhism, according to some Mahayanist schools, a Buddha is a personification of his teaching, his knowledge “Dharma” itself being the highest form of Buddhahood. The teaching or Dharma - and hence its embodiment, a Buddha - can be symbolized by holy texts. The earliest archaeological evidence for a Buddhist stupa dates to the late 4th century B.C.E. Many early stupas were small tumuli, they seem to have been places of worship of laymen in the first place, donated by kings and by wealthy merchant guildes. One of the very few stone buildings yet found in India that might be dated before Ashoka's reign is one of the two stupas at Jarasandha ki Baithak near Rajgir (the ancient Rajagriha/Rajagaha). Remarkably, it has not a circular layout, but almost a square groundplan. It measures 26 m at the base, reaching a height of just about 8 m.
One of the oldest stupas was excavated in Piprahwa at the Indian border to Nepal. Many consider Piprahwa to be the ancient Kapilavasthu (Kapilavatthu), hometown and residence of the the Shakya clan of the Buddha. Piprahwa is famous for an urn with a very early inscription indicating it contained ashes of the Buddha. The ashes found in that urn were distributed among several Buddhist nations. One of the stupas now enshrining the Buddha's ashes is the Golden Mount at Wat Saketh in Bangkok. Another one is Ruwanweliseya in Anuradhapura. A flat tumulus was built on this burial place by the Shakya family of the Buddha soon after his passing away. 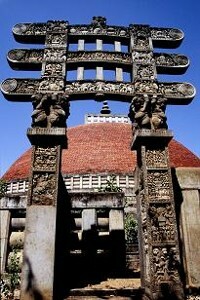 This first stupa at Piprahwa consisted of a circular adobe structure measuring 39 m in diameter and only 1 m in height. The second phase is believed to have been built by Emperor Ashoka in the third century B.C.E. This second phase of the Piprahwa stupa was built of mud bricks measured 35 m in diameter and 6.7 m in height. In the course of time, some stupas for highly respected relics were integrated in monasteries, which were dependent on the support of local lay communities. The monks themselves were not interested in relic worsip, as it is not a part of the path to salvation. Canonical scriptures recommend stupa worship only for laymen explicitely. Earliest evidence of stupas in monastic complexis also dates back to the reign of Emperor Ashoka. ​The stupa in Sanchi, situated in 9 km distance from the ancient Vidisha, hometown of Ashoka's wife, seems to be from this period. But today's appearance is the result of enlargements and embellishments in the middle of the 2nd century B.C.E., under the auspices of Central India's Shatavahana dynasty. Since then, it measures 37 m in diameter. Indian stupas in Sanchi, Bharhut and Amaravati obviously replicated older wooden architecture in stone, gates and railings in particular bear characteristics of their wooden predecessors. The tall Dhamek stupa in the deer park of Sarnath near Varanasi, marking the spot of Buddha's first sermon, rises to a total height of 34 m.
India's largest giant stupa is in Kesariya in Bihar state, halfway between Vaishali and Kushinagara, two major Buddhist pilgrimage sites to the north of the river Ganges. It marks the place, where Lord Buddha, on his last journey, handed over his alms bowl to the people of Vaishali, who had followed him to this point, begging for his return. 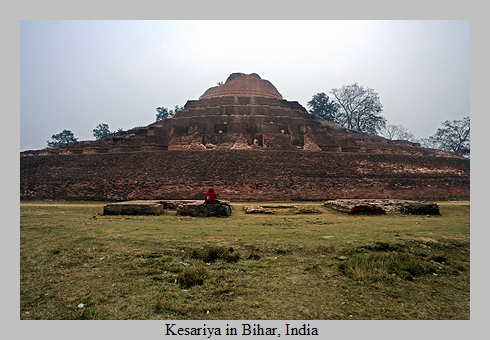 The Kesariya stupa is probably pre-Gupta, this means, it's roughly from the third century C.E. It's a giant stupa indeed. The diameter is 128 m. And the height is still 104 m. It had been 123 m tall before the 1934 earthquake in Bihar. The Dharmarajika stupa in Taxila, Pakistan, is also surrounded by a monastic complex. It is believed to have been established by Ashoka, too. This stupa, popularly known as "Chir Tope", measured 50 m in diameter. Today, it still reaches a height of 15 m. Originally, the Dharmarajika stupa was a hemispheric dome and the world's largest stupa in the Mauryan period (3rd century B.C.E). It was destroyed by an earthquake in the 1st century. An even larger Dharmarajika stupa was then built by the Kushan dynasty. It was during this Kushan period that the most famous Mahayanist philosopher, Nagarjuna, and the first writer of an Ayurvedic textbook, Charaka, lived in Taxila. The famous Dharmarajika stupa was heavily damaged, when the Hephtalites (White Huns) invaded northern India in the 5th century, and has never been restored again. The Kanishka stupa, situated in the outskirts of Peshawar, was ancient India's most monumental stupa. It was erected by the famous Buddhist king Kanishka of the Kushan Empire during the 2nd century C.E. and destroyed by the invader Mahmud of Ghazni in the early 11th century. The Kanishka stupa was described in detail by several Chinese pilgrims, who stated it had a height of about 200 m, significantly higher than today's tallest stupa. There is archaeological evidence that this record-size Kanishka stupa had a diameter of 87 m, which is in full accordance with the Chinese accounts. Dating from the middle of the first millennium, there are some other impressive stupas still existing in Pakistan's Swat valley, 200 km north of Taxila and 125 km northeast of Peshawar. The Swat valley stupas are not as voluminous as the Dharmarajika and Kanishka stupas had been in the first millennium, but they are much better preserved. The total height of the Shingaradar Stupa from the dome to the existing base is 27 m. The diameter of the Amluk-Dara Stupa near Balikot is 21m, with a height of 20 m.
Those famous largest stupas of ancient India (today's India and Pakistan and Bangladesh) are worth mentioning in a report about Sri Lanka's giant stupas, for a comparison. Having those hugest Buddhist structures of mainland India in mind, you can better judge and value the achievements of the contemporary Sinhalese island civilization. Less than a century after Emperor Ashoka had built the Dhamarajika stupa in Taxila, a stupa of more than the same size, with a diameter of 51 m, was constructed in Anuradhapura. It is called Mirisaveti. When it was finalized, it was largest stupa of its time. But today, the fully restored Mirisaveti appears to be modest in size, because in close proximity a stupa of five times that volume, measuring 92 m in diameter and 91 m inheight, was erected only one generation later. 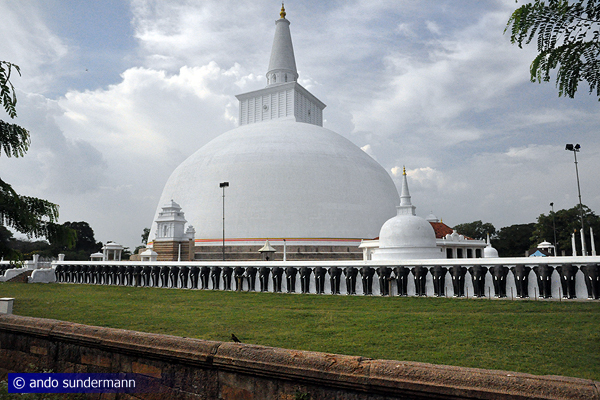 This record-breaking stupa is Sri Lanka's landmark white dome, Ruwanweliseya. Though it was, two and a half centuries later, surpassed in height by the Kanishka stupa near Peshawar, the much admired Kanishka stupa did not match the volume of Ruwanweliseya. Furthermore, Ruwanweliseya exists till the present day, whereas the Dhammarajika-Stupa is in ruins and the giant Kanishka stupa almost disappeared, except from its foundations. This is all the more remarkable, as the Sinhalese, in contrast to many of India's big stupas, used a much smaller entity for building their giant stupas: brick stones instead of natural stones. And Ruwanweliseya is not the end of the story. Two more stupas in Anuradhapura from the first half of the first millennium and one in Polonnaruwa from the twelfth century are even larger giants. These are not only Asia's biggest ancient stupas at all, they are in fact the entire world's largest buildings made of (fired) brick, till the present day. But how can it be claimed, that Sri Lanka's giant stupas are even larger than India's Kessariya stupa, which has a much larger diameter and is significantly higher? Anuradhapura's largest stupa is Jetavanarama, from one frontispiece (Vahalkada) to the other one on the opposite site, it measures 125m in diameter, 3 m less than the Indian stupa in Kessariya. The answer is: The reason for the bigger volume of Anuradhapura's stupas is that they are hemispherical, whereas the Kessariya stupa is conical, indeed not even with a straight contour, but concave. The bubble-shape contour of Sri Lanka's giant stupas is convex. This means: The diameter remains to be large in a higher altitude. In contrast, the Kessariya stupa has the very large diameter only on ground level, but it is much smaller only a few metres above ground level. Its diameter decreases very suddenly. Actually, the 128 m diameter of the Kesariya stupa in India is only a diameter of the ground level. This means only a large substructure, but comparing the substructures: The brick-made elevated terrace of the Jetavanarama Dagoba, which is also a few metres high,is much larger: The total diameter of the entire Jetavanarama building is 180 m (! 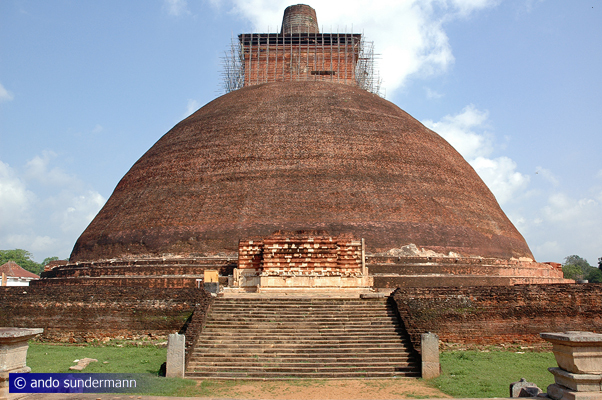 ), if compared to the total diameter of the Kesariya stupa of 128 m. Today's height of the Jetavanarama giant stupa in Anuradhapura is 122 m, compared to 104 of the Kesariya stupa. The original height of the Jetavanarama Dagoba was 160 m. Actually, the Kanishka stupa near Peshawar is believed to have been much higher, but this was a very slim tall building, a tower, not a dome like the giant stupa of Jetavanarama. So Jetavanarama is today's world record stupa in size. It was once surpassed only by the flat but extremely wide Demala Maha Seya in Polonnaruwa, which is in ruins now. All other famous giant dagobas in Asia are younger than those of Anuradhapura in Sri Lanka, most of them much younger. The most famous stupas in Nepal are those of Bodnath and Swayambunath in the Kathmandu valley. They were founded by the Licchavi dynasty in the 5th/6th century, though their mythology claims a much earlier origin. Probably, the Bodnath stupa reached a height of 36 m in later centuries. It measures 82 m in diameter at its base, but the hemispherical dome has a diameter of only 20 m, similar in size to the Swayambunath stupa, which is 36 m high. Definitely, the most precious stupa at all is the Shwedagon Pagoda in Yangon (Rangoon), former capital of Myanmar (Burma). It is thickly covered with pure gold. And its of enormous size indeed. 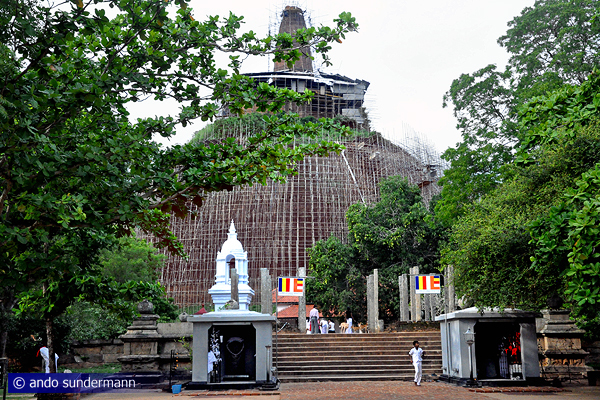 It raises about 100 m above the ground level of the stupa terrace and has a diameter of 136 m at the bottommost terrace, more than the Jetavanarama dome in Anuradhapura but much less than its buttommost terrace. As in the case of India's Kesariya stupa, Myanmar's Shwedagon Pagoda is of a concave shape, this is why the volume of the hemispherical Jetavanarama is much larger. Legend has it, that the Shwedagon Pagoda was founded by the first lay followers of the Buddha, Thapussa and Bhallika, who had taken refuge to his Dharma even before the Sangha, the monastic order, was established. 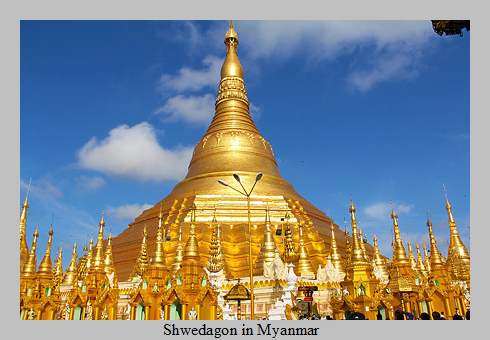 In this case, the Shwedagon would be the oldest Buddhist stupa at all. However, there is a competitor in Sri Lanka. The same foundation legend is talled in Thiriyai near Trincomalee: The Girihanduseya dagoba in Thiriyai also claims to be founded by the merchants Thapussa and Bhallika and to shelter the hairs of the Buddha he once gave them. Legends have it, that Shwedagon is the only stupa in the world containing relics of all four previous Buddhas of our Kalpa (world age). However, this is not unrivalled, either. The same is believed in Sri Lanka to be true for the Seruwawila dagoba, also known as Seruvila, in Trincomalee District. Myanmar's incredibly beautiful golden Shwedagon Pagoda in Yangon reached its final height in the 19th century. There is another giant stupa in Myanmar often claimed to be the world's largest dagoba, at least, if it would have been finalized. There is an impressive almost cubic mountain of bricks in Mingun near Mandalay. The Mingun Pagoda, also called Matara-Gyi Pagoda, was founded in 1790 by King Bodawpaya with the intention to erect the tallest stupa of the world. But when the king died in 1819, the construction works came to an end. The length and width of the square groundplan is 75 m. The proposed height of the dagoba was 152 m. Indeed, it would have surpassed all existing giant stupas in height, though the destroyed Kanishka stupa had been even taller one millennium earlier. The biggest stupa in ancient Thailand was Chedi Luang (literally meaning "Stupa Large") in Chieng Mai, 82 m wide and 54 m high, before it collapsed. It belonged to the Kingdom of Lan Na, which was independent from the larger Thai kingdom for most of the time. Today, the No.1 giant stupa of Thailand is Pra Pathom Chedi in Nakhon Pathom, which was completed in 1870. It was constructed at the site of a smaller ancient stupa from the pre-Thai Dvaravati kingdom. With a height of 121 m, Pra Pathom Chedi is the tallest giant Stupa in the world, because the even taller ancient Kanishka stupa was destroyed in the 11th century, as already mentioned. The diameter of the bell-shaped dome of Phra Pathom Chedi is 80 m, the diameter at the basis of the platform is 180 m.
Before describing Sri Lanka's giant stupas on this page, we will also present two of the earliest stupas on the island, which are smaller, see below. 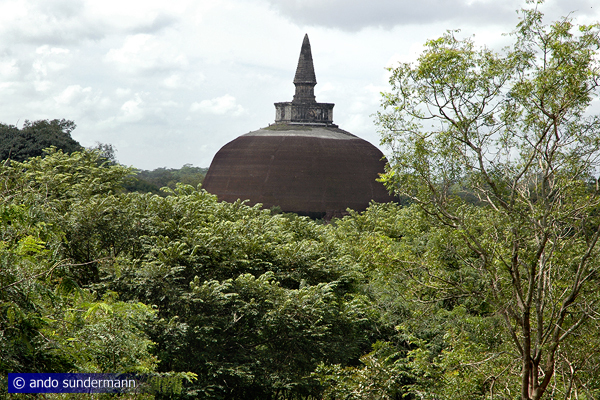 Thuparama, also spelt "Thuparamaya", is not a giant stupa but noteworthy as the first stupa in Anuradhapura and, most probably, the oldest one in Sri Lanka. 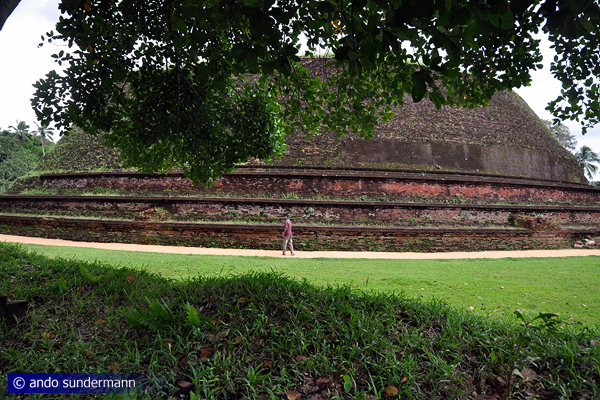 Thuparama is situated at the northern end of the Mahavihara complex. The Mahavihara was the first monastery founded in Sri Lanka officially observing the canonically prescribed rules of consecration. Soon after, the Sinhalese king sent an envoy, Sumara, to Emperor Ashoka asking him for relics as a gift. He got the right collarbone of the Buddha, which was enshrined in the newly erected first stupa of the Sinhalese kingdom. It fell into decay several times, but was restored again and again. During the reign of King Aggabodhi II in the 7th century, 2 circular rows of columns were added to carry a roof, altering Thuparama to a Chetiyaghara, a "Stupa-House." Today's white dome is the result of a restaurationdone in 1862. 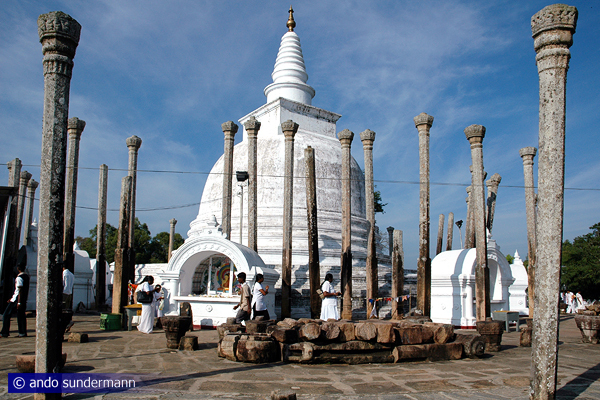 The best preserved original stupa architecture of Sri Lanka can be seen in Mihintale. The Kantaka Chetiya is one of the first stupas erected in Sri Lanka, presumably already in the 3rd century B.C.E., when Buddhism was introduced in the Sinhalese kingdom. Epigraphic evidence attributes a restoration of this stupa to King Lanja Tissa (Lajitissa), who reigned from 119 till 109 B.C.E. The lower levels of the Kantaka Chetiya are in such a good state of preservation due to the fact that this stupa had been covered by soil for centuried, before it was excavated in 1934. It’s 12 m high now. Originally, the dome had a height of 30 m. The diameter is 41 m. The most remarkable feature are the four frontispieces. Such Vahalkadas placed in front of the dome at the cardinal points are typical for Sinhalese stupas. They are elaborately sculptured with earliest examples of Gana dwarfs in different actions and with animals. Mirisaveti, also spelt "Mirisawetiya" is a stupa situated between two ancient tanks at the western side of Anuradhapura. Mirisaveti was the first giant stupa erected in Sri Lanka and the first major construction project of the Sinhalese national hero, King Duttha Gamani (Dutugemunu), who defeated the Tamil King Elara, who had previously ruled in Anuradhapura, When Dutthagamani took a bath in the nearby reservoir called Tissawewa, he left his weapon, the royal lance, behind him. The lance was a sacred weapon. The Buddhist Sangha had once encouraged Dutthagamani to free Anuradhapura from non-Buddhist rule and endowed an original Buddha relic, which was kept in the royal lance. When Dutthagamni now came back from his bath, he found himself unable to move the lance from the place, where he had left it. So he understood: This was the place the relic had chosen to be buried under a giant stupa. Ruwanweliseya is the main stupa of Sri Lanka's first monastery, Mahavihara. 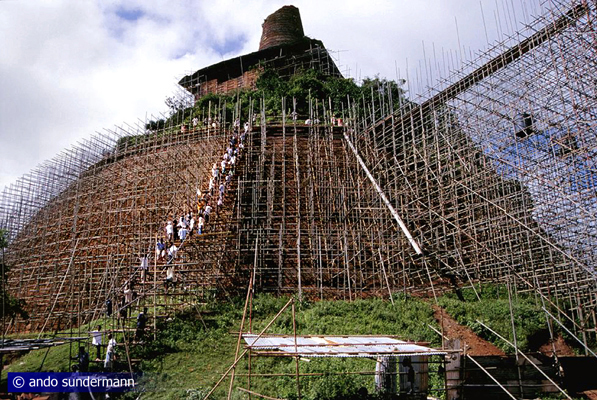 The construction of this giant dagoba was the meritorious work of Sri Lanka's famous king Dutthagamani (161-137 B.C.E.). Pious Buddhist kings had to care for the welfare of the people by constructing reservoirs and to support the Buddhist order, particularly by donating or restoring edifices. So Sri Lanka's great king decided to erect a Buddhist monument on an unprecedented scale, but without forced labour. Very much committed to this project, he did not see his giant stupa's completion. But when Dutthagamani lay on his deathbed, his brother used a trick to please him. He built a bamboo-and-cloth finish to the stupa, so that Dutthagamani's died with a final sight on the full size of his white dagoba. The Ruwanwelisa was completely overgrown, when monks started restoring the dome in the end of the 19th century. 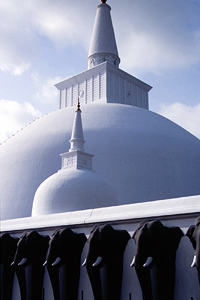 The Abhayagiri Dagoba is the centre of the monastery of the same name in Anuradhapura. It was founded by King Vattagamani Abhaya, known as Valagamba in Sinhala, one of the island's most significant Buddhist kings. The Abhayagiri Dagoba surpassed the giant stupa of the rivalling Mahavihara monastery, Ruwanweliseya. The diameter of the Abhayagiri stupa is 150 m, total height is 115 m. Abhayagiri Vihara is the largest ancient monastic complex in Sri Lanka and a focal point of the UNESCO sponsored excavation and development project called "Cultural Triangle". The Abhagiri monastery welcomed Mahayanist traditions and was a pioneer in the development of the island's art. The decorations at the four frontispieces (Vahalkadas) of this giant stupa are regarded as the best examples of this typical sculptural decoration, besides those at the Kantaka Chetiya in Mihintale. 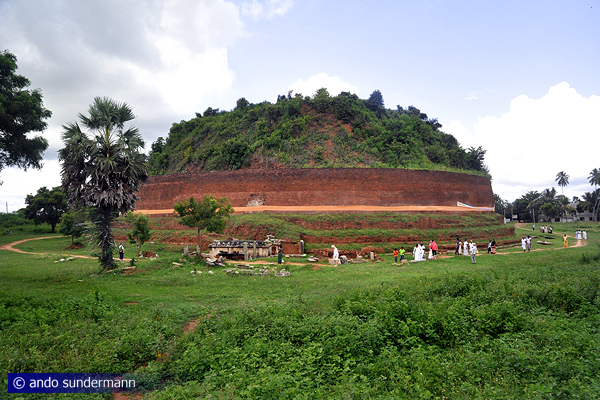 As already mentioned, the Jetavanarama Dagoba is the largest ancient stupa dome at all. It was scientifically restored in the beginning of our century. The giant stupa forms the centrepiece of the systematically planned Jetavanarama monastery. This monastery is a result of a shism of the Mahavihara monastery. Indeed, the Jetavanarama stupa is erected on former temple land of the Mahavihara. Using the consecrated area for other projects without the consent of the monastery is actually a sacrilege in Buddhism. King Mahasena, who promoted the newly established Jetavanarama monastery at the end of the 3rd century C.E., is therefore considered as a heretic in the ancient chronicles. Nevertheless, the Jetavanarama remained to be one of the three major Buddhist orders of the Sinhalese island nation in the subsequent seven centuries of the Anuradhapura period. You may be surprised to hear and see the answer to the question: Which is the largest stupa ever built in the entire world. The answer is: Demala Mahaseya in Polonnaruwa. And the surprise is: There's almost nothing to see any more of this giant stupa once built by Sri Lanka's most powerful king, Parkramabahu the Great (1152-86). Probably, it was never completed. But the work done so far, was already a superlative. Today, it is only a small hill covered with shrubs. Only few parts of the former giant stupa were excavated. The hill, which appears to be natural, is not at all spectacular. It is not as tall as the giant stupas of Anuradhapura, but much wider. So the superlative was the volume of this brick building. "Mahaseya" simply means "great stupa", "Demala" is a Sinhala word for "Tamil". The name refers to the legend, that Tamil prisoners brought from India were forced to construct this monument. ​Actually, the Demala Mahaseya might derive its name from the term “Demahal”. which can mean "two-storey". 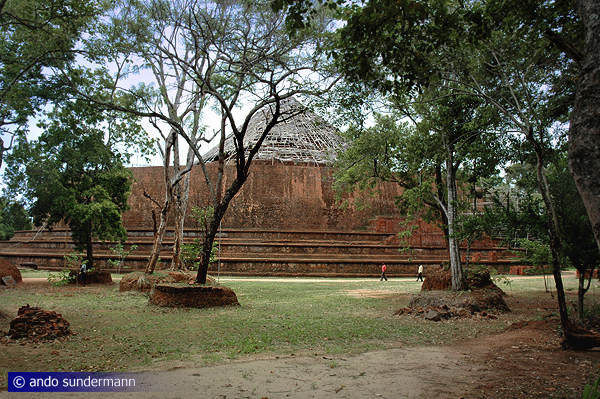 The large dagoba was flat, compared to the almost hemispherical domes of the much earlier giant stupas in Anuradhapura. But this is probably the result of a new form of stupas developed in the Polonnaruwa period, particularly during the reign of King Parakramabahu I. This form is "two-storey" indeed. The wide dome is cut in height, but in the centre of the elevated platform atop this wide lower dome is a second stupa of a much smaller diameter, forming the second storey of the entire stupa building. This new form of giant stupas cannot be recognized easily at the overgrown Demala Mahaseya, but it is nevertheless present in Polonnaruwa, only on a smaller scale. The Pabulu Vehera close to the centre of Sri Lanka's medieval capital shows this unusual "two-storey" form. Though a new form of stupas emerged in this period, there is nevertheless an example of the classic hemispherical style of Sinhalese stupas in Polonnaruwa, too. Though not as huge as the three largest dagobas of Anuradhapura, the Rankot Vehera near Polonnaruwa's main monastic complex, Alahena Pirivena, is still of an impressive size. The Rankot Vehera is the landmark giant stupa of Polonnaruwa. It was constructed in the late 12th century by King Nissanka Malla, who was eager to surpass his predecessors in Polonnaruwa, at least in quantities of inscriptions, donations and building activities. Not only the form resembles that of Anuradhapura's giant stupas. In fact, a stone inscription situated close to the stupa identifies it by the name "Ruwanweli". The diameter at the base is slightly more than 60 m, the total height is 55 m. The name "Rankot" means "golden pinnacle". Dedigama in the western foothills of Sri Lanka's central highlands is the birthplace of King Parakramabahu the Great. The chronicles mention that he erected a giant stupa at the location of the house in which he was born. It is quite sure, that this stupa is that of Dedigama. The 78 m wide giant stupa is also known as "Kotavehera". Literally, this means "short stupa". It may refer to the shape of this stupa. It seems to be cut at half of a dome's height. It is not entirely clear, whether the Dedigama stupa remained unfinished or if this was intentionally chosen, corresponding with the new type of stupas developed in Polonnaruwa. 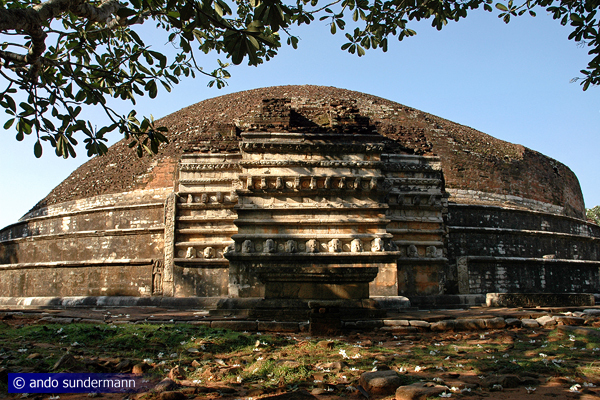 Though rarely visited, Dedigama is an exciting stupa, because the relic chambers were untouched. The excavation was one of the most fascinating in Sri Lankas archaeology. Many of the findings, some of them golden or gilded statues, are exhibeted in a museum just 100 m away from the stupa. 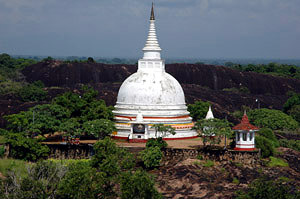 The Yudaganawa dagoba is the largest stupa in southern Sri Lanka. 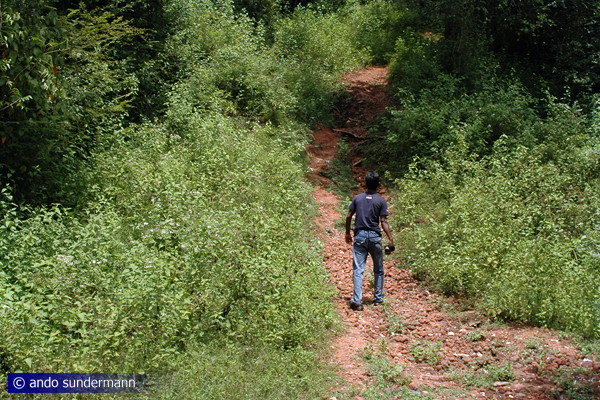 It is said to be at the site of a battle between Dutthagamani and his brother in a war of succession. This battle took place in the 2nd century B.C.E. 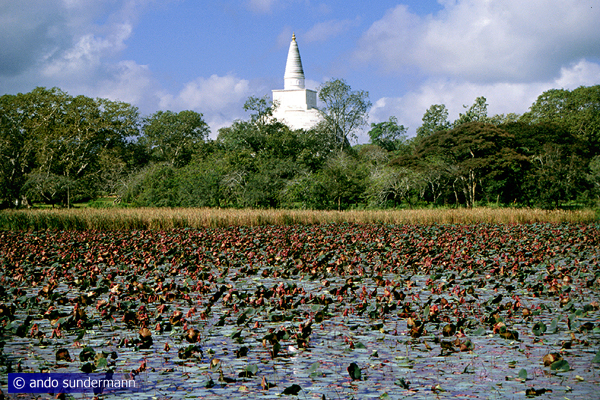 It is possible that a first stupa was built here during Anuradhapura period. But is highly unlikely that the stupa which can be seen today is from this early period. There are many different datings. But most probably the giant stupa in Yudaganawa, 95 m wide and in the "two-story" shape, is from the reign of Parakramabahu I, the famous Polonnaruwa king. Like Dedigama marks his father's hometown, Yudaganawa is believed to be his mother's hometown. Erecting stupas in Polonnaruwa and in the west in Dedigama and in the south in Yudaganawa symbolizes the unification of all parts of the island under Parakramabahu, Rajarata, Dakkhinadesa und Rohana respectively. Digavapi is the only giant stupa in Sri Lanka's Eastern Province. The diameter at the base is about 90 m. This is all the more impressive as it could have been a full-sized dome. In this case, the Digavapi stupa would have been much bigger than the Yudaganwa stupa. 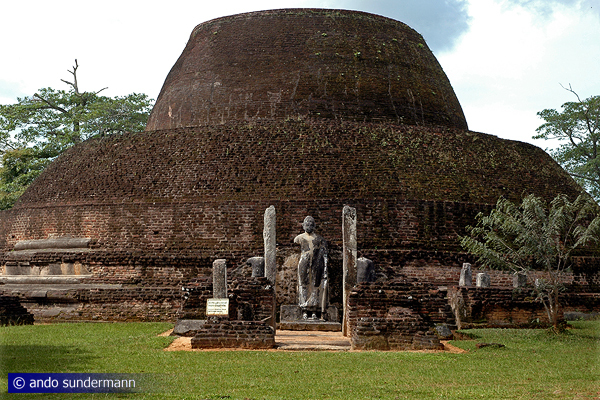 The Digavapi stupa is usually attributed to King Saddha Tissa, Dutthagamani's brother, who had been the local ruler in the east before becoming Dutthagamani's successor in Anuradhapura. In this case, the giant stupa of Digavapi would be drom the same period as the Ruwanweliseya, this is the 2nd century B.C.E. More likely, it was enlarged in later centuries. According to the chronicles, Digavapi is one of the places visited by the Buddha, a so-called "Solosmasthana" site, one od the 16 most sanctified places in Sri Lanka. Since restoration works in the 1920s, Digavapi has become an important pilgrimage site again.